Please enjoy my latest blog published by Psychology Today entitled Rejoice and Be Glad … Or at Least Give It a Shot. Sometimes our days bring things for which it’s hard to be grateful — things like pain, sadness, fear, depression, disappointment, exhaustion, or a feeling I like to call “just plain ugh.” We’ve all had those days when we feel just plain ugh. But even in the worst times of ugh, while we may not feel like we can rejoice and be glad, we should at least give it a shot. Does every difficult situation have the seed of a blessing? Let’s test her statement. Let’s start with something basic — like our alarm clock going off in the am. While most of us say ugh, we should rejoice and be glad because hearing an alarm clock ring means that we’re not dead; we woke up, aches and pains and all, for as the old saying goes, “Every day above ground is a good day.” An alarm clock going off means more than likely, that we have a roof over our head, (because we probably wouldn’t need an alarm clock if we were forced to sleep outside). An alarm clock means that we have electricity (which then presumes we are able to cook a hot breakfast, take a shower with hot water, and read the newspaper with electric lights). An alarm clock ringing early in the am probably means that we have a job (with a paycheck, and healthcare). An alarm clock ringing means that we have a purpose, a reason to get up, a calling (which is the basis for a long a happy life). So rejoice and be glad when that clock goes off! Consider another example. How about the headlines of the paper? There were many people who were not rejoicing or glad after last week’s elections. But consider this: if you walked into a voting booth last week, you had the blessing of freedom. That is especially poignant this week, as November 9th was the 25th anniversary of the fall of the Berlin Wall – a wall that, as German Chancellor Angela Merkel commented, came tumbling down because of an irrepressible yearning for freedom. 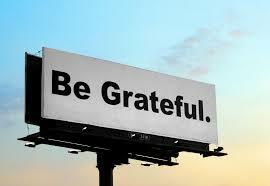 This week, think about adding a little gratitude to your life. Put your shoes way under your bed at night. Strive to see your blessings even in the hardest of times. Granted, it may be difficult; but every day that alarm clock goes off is a gift and a day we should rejoice and be glad in it … or at least give it a shot.